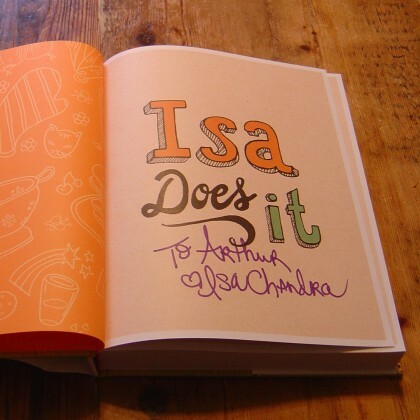 My son Arthur is a big fan of bestselling vegan cookbook author Isa Chandra Moskowitz, but as he’s off in college in Washington, sadly (as in “NOOOOOOO” and “She really should have come over winter break”) he could not come with me to her Bookshop Santa Cruz reading/Q&A session/ signing for her newest book, Isa Does It: Amazingly Easy, Wildly Delicious Vegan Recipes for Every Day of the Week. 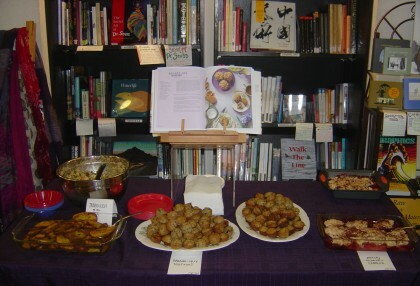 I sat in the front row, next to Amey Mathews of the Vegan Eats & Treats! blog, and her mother, on-and-off-again mayor and city council member (these offices rotate a lot here in Santa Cruz) Cynthia Mathews, who gave Isa a proclamation and certificate naming her an honorary citizen of Santa Cruz. Personally I had some “Peachy Raspberry Cobbler” in addition to the banana-nut muffins, and there were also platters of “Tabbouleh of the Sea” and “Garlic Curry Baked Fries”. Isa started out by reading her Isa Does It introduction pages (in the “About” page for this blog I had mentioned being a teenage vegetarian in the 1970’s land of “Hamburger Helper and TV dinners”, so I got a kick out of hearing her describe her start as a teenage vegetarian in the 1980’s land of “Hamburger Helper and powdered mashed potatoes all the way”), but she mostly wanted to have a conversation with the audience on any topics they liked, even offering to give relationship advice. An audience member wanted some where-to-get-started advice for someone new to vegan cooking (and maybe pretty new to cooking *period*). Isa recommended soups, that with soups it didn’t matter if your chopping was sloppy and so on, and also that all the soup recipes in Isa Does It were very filling, so that once you made the soup it could just be a whole meal. One woman said that she actually did have a relationship-advice question, which turned out to be about wanting suggestions for a vegan dish to bring to a Thanksgiving dinner. Isa said that this was to some degree a size-matters matter, that it was good to bring something big. She said that one good choice would be a platter of chickpea cutlets (from her Veganomicon cookbook – Arthur likes these) with mushroom gravy, that these were easy to make and very popular. In that vein, she was always quick to recommend other people’s vegan cookbooks and blogs when asked about topics — such as making your own vegan yogurt or puff pastry — that weren’t really her thing. Another person asked for advice on cutting down their usage of Earth Balance margarine (because of wanting to avoid palm oil). Isa said that she has basically stopped using Earth Balance herself — that none of the recipes in Isa Does It use it — and that she now uses a mix of 2/3 coconut oil and 1/3 applesauce instead. She said it was a little tricky to get a feel for using coconut oil — that among other things you needed to find a spot in your kitchen where it would stay soft and spreadable rather than melted or hard — but that once you got a handle on it it was great. People were definitely interested in why she had moved from extremely-vegan-friendly Portland to Omaha a few years ago, and there were a variety of factors involved: For one thing, her boyfriend was from Omaha, and it was a place where she could actually afford a house with a garden and room for cats. Also, Portland had such a big vegan scene already (including vegan infighting) that there wasn’t that much for her to do, whereas Omaha presented a challenge in getting a vegan scene going — there are now regular vegan meetups, she’s gotten at least one Meatless-Mondays program started, and, in more exciting news, she is now starting her own and Omaha’s very first vegan restaurant, “Modern Love“. She also said that living in Omaha had really helped to shape the “fast and simple and delicious” emphasis of Isa Does It — when you’re living in a place where a lot of specialty vegan ingredients are not available, and where you can’t just go somewhere for vegan takeout when you don’t feel like cooking, then you’re going to be doing a lot of cooking every day, and you don’t want to spend three hours on each meal, you want everything to be, yes, fast and simple and delicious. Isa was blissed out about this being her first full-color cookbook, chock full of beauti-full (sorry, I just can’t stop saying “full”) full-page photos of most of the recipes, and about what an amazing job the photographer did in a very small space full of funky 10 and 25-cent Nebraska-thrift-stores bowls and plates and so on. 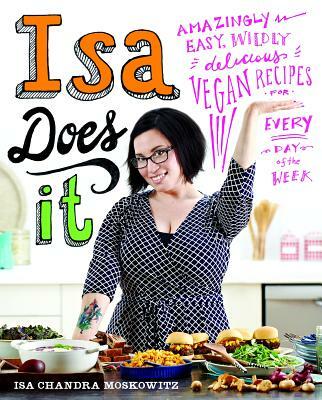 She was so thrilled with it that she joked about wanting to leave bad reviews on Amazon for Veganomicon, telling people to buy Isa Does It instead. More later, perhaps, as more topics come to mind. I will also mention that when I was waiting in the autograph line, the person in front of me had Food Fight and Herbivore buttons on her backpack just like Arthur has stickers on the walls. Get it from Bookshop Santa Cruz!